Does this acoustic amp raise the bar? One of the best-sounding, fully-featured acoustic amplifiers on the market right now. Easy-to-use reverb, delay and chorus effects. Looper and harmony effects are excellent. The gold lettering is small and difficult to see in low lighting. Over the last few years, compact acoustic amplifiers have become almost as popular as regular electric guitar amps. Not just for the solo performer who doesn’t want the hassle of lugging a PA system around, but also for the musician in a band playing both acoustic and electric guitars. In essence, acoustic amplifiers are portable PA systems complete with a built-in mixer and an electronic effects unit. The Boss Acoustic Singer Pro takes this concept a stage further by adding advanced facilities, connectivity and useful multi-effects that serve both guitar and vocals. The design uses discrete electronics for the input stages, which imparts a studio-like transparency and sound quality. There are two channels: one for guitar and one for microphone. Should you wish, you can use the mic channel for an additional guitar, thanks to the combined TRS jack/XLR input connector (the jack being Hi impedance and the XLR Lo impedance). Let’s take a look at the guitar channel first. A single 1⁄4” jack is used for the input, adjacent to which are Pad and Acoustic Resonance switches, which respectively allow adjustment for input sensitivity and simulated guitar body resonance. The EQ section comprises bass, middle and treble controls, all of which are especially voiced for acoustic guitar. Next comes the Anti-feedback control. This is a mid/lo frequency notch filter that selectively enables you to control feedback. Another feature that helps with resonant feedback is the ability to switch the signal phase. This is controlled with a small switch placed near the Anti- feedback knob. The last section on this channel is for the built-in effects, namely chorus, reverb and a looper. Two levels of chorus are available, the first having a subtle transparency, with the second being more lush and complex. Both are musical. The reverb goes from room-size to an enveloping cathedral-size, changing both the level and intensity as you turn the knob. It’s an interesting, great-sounding effect! The looper is operated from either the front panel or, more effectively, by using a Boss FS-6 pedal and an appropriate stereo lead (available separately). As is usual with most loopers, you can record a track then overdub another. The operation is easy and accurate, with the only limitation being that you can’t control the overdub levels. As mentioned earlier, the mic channel has a combo TRS jack/XLR input connector that ensures good connectivity by enabling you to use a microphone with either an XLR or a jack lead - or another guitar, should you wish. Next to the input socket is a pad switch and a phantom power switch for use with condenser mics. After the volume control comes the EQ section with bass, middle and treble controls, again voiced for optimal response for voice and guitar. Following this is the anti-feedback notch control, especially useful for microphones. Again there is a phase switch, which is useful as an additional anti-feedback device. The ambient section comprises a delay/echo and a separate reverb control. The delay and echo are controllable with a one-sweep knob, as is the reverb effect. The reverb is as immersive here as it is on the guitar channel. in harmoniser. There are three controls associated with this effect: a level control and two push switches - one to turn the effect on and the other to control pitch of the harmony. There are three choices here. One is labelled High and gives the next harmony above your voice - the note being dependent on the melody line against the chord (which is how the harmoniser knows the correct harmony to choose). The next setting is Unison, which gives that classic double-tracked vocal effect. The last setting is labelled Low. This, unsurprisingly, gives you the lowest harmony in the sequence. The harmony effect tracks surprisingly accurately, with little or no time delay and none of the robotic vocal sound that some machines suffer from. You can buy the Roland GA-FC multi-footswitch to control the harmony function, along with reverb, delay and chorus effects. The final features on the front panel are as follows: the master volume control, tweeter attenuator (to protect the tweeter from transient signal spikes), the mute switch and the mains power switch. The back panel features a host of connectivity. The mains IEC socket is found here along with all the foot control sockets (the various foot switches are available separately). There is a 3.5mm auxiliary input socket with a level control, for use with an audio playback device. If you’d like to connect the Acoustic Singer Pro to a PA system, you’ll be pleased to know that each channel has its own switchable XLR output socket. The three-way switches enable you to choose between Mix/Post EFX/DI. The switch positions depend upon the device you wish to connect to and whether or not you want to include the built-in effects. Finally, there’s a USB-B socket via which you can connect the Acoustic Singer Pro to a computer so that it acts as a sound card. This is a cool feature as it enables you to record your performance via pretty much any DAW software. We’ve had this amp for a few days and tried it out with several different guitars and microphones just to get a feel for how it sounds. The voicing of the amplifier is excellent, as is the tonal flexibility and feedback suppression - even at higher volumes! We own a Gibson Chet Atkins SST, which is a solid body ‘acoustic’ guitar. By using the resonance control, we were able to get very close to the sound of a real acoustic guitar. The effects sound good, too, but more importantly it’s not complicated to get a good sound. We particularly liked the fact that Boss included a looper and harmoniser in the price. This a good looking and great sounding amplifier. At first glance the features and multi-effects may seem sophisticated, but they are easy and intuitive to use. Boss has put detailed videos online to guide you through the set-up and connection procedure. 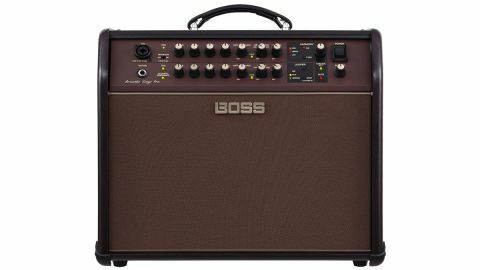 There is no doubt here that the Boss Acoustic Singer Pro is one of the best-sounding, fully-featured acoustic amplifiers on the market right now.